I was working from home today, being rather productive I must say, when I looked out my window and noticed mass carnage. 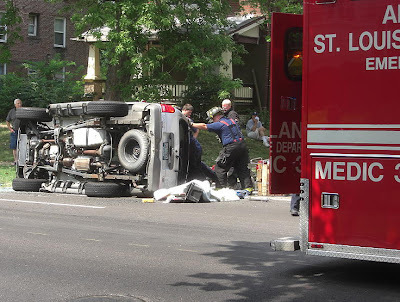 An SUV was flipped on its side and there were ambulances, fire trucks and police everywhere. McCausland was blocked off from I-40 to Dale for about four hours. At one point, a shirtless and bloody man was pulled from the wreckage and hauled off on a stretcher to an ambulance that hurriedly took off with its sirens blaring. Too bad that’s where the story gets boring. I spoke to a witness who said she saw the mom climb out of the driver's side window after the wreck. She was screaming, "My babies! My babies!" I never saw any babies. Just the bloody man on a stretcher. Then, the police took a few pictures. As did I. A tow truck hauled off the SUV. The fire department hosed glass off the street.